Scabies is caused by the human itch mite burrowing along the skin and laying eggs. Itchy blisters and red patches form over the eggs. Scratching can lead to serious skin infections and skin infections can lead to blood and kidney infections reports the New Zealand Ministry of Health. Permanent scarring and difficulty concentrating in school or at work are other negative outcomes. Scabies has nothing to do with cleanliness and affects people of all races and social classes reports the Centers for Disease Control and Prevention. It usually takes direct and prolonged contact with a scabies-infected person to contract the mites. Only 10 to 15 mites are present on a person infested with scabies. Scabies usually affects members of the same family, sexual partners and children’s friends. 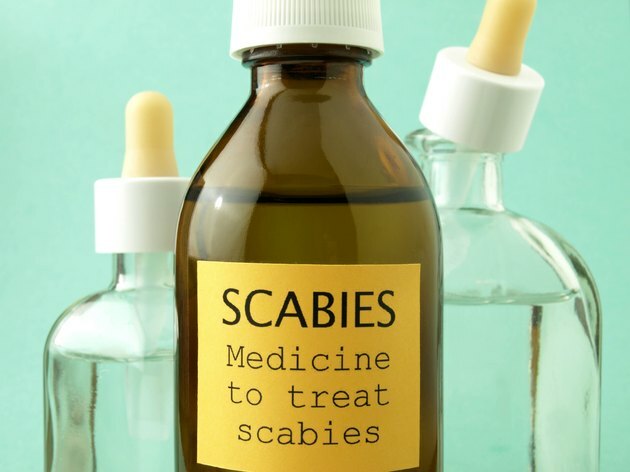 Scabies can spread in crowded areas where body and skin contact frequently occur such as child care facilities, nursing homes and prisons reports the CDC. While scabies can spread through the sharing bedding, clothing or towels, this is uncommon unless a person has the more severe Norwegian or crusted scabies. Crusted scabies can strike people with compromised immune systems and is highly contagious. Thousands of mites may exist in the thick crusts of skin. People with Norwegian scabies may not experience the classic blistered, reddened and itchy rash. Scabies symptoms can take as long as a month and a half to appear if you’ve never had scabies before but you can still spread the infestation at this time. Scabies symptoms appear in one to four days in those that have had scabies before. Scabies mites cannot live in carpets and furniture. They die within 48 to 72 hours once they are not on a human being. Animals do not carry the human scabies mites and it is very unlikely that the mites would survive in a swimming pool. It is also highly unlikely that the mites would venture out from wet skin, reports the CDC. Sharing a beach towel with a person that has crusted scabies can increase your chances of contracting the mites and having contact with someone with Norwegian scabies highly increases the risk of transmission in swimming areas. Swimming in salt water or washing with soap and water will not cure scabies. A prescription cream is needed to destroy scabies and all family members must be treated whether they have symptoms or not. All bedding, clothes and towels must be washed in hot water or bagged in plastic for four days. Blankets can be hung outside in the sun. Vacuuming is recommended but fumigating your house is unnecessary according to the CDC. Should I Avoid Swimming If I Have Molluscum?